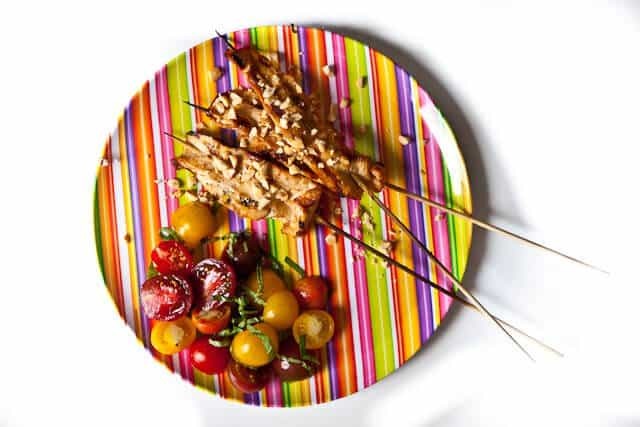 Grilled Chicken Satay is super easy to make – 1 bowl, 1 knife and 1 cutting board. Oh, and don’t forget the sticks too. Instead of making a peanut dipping sauce, I decided to include the sauce flavor in the marinade and top with chopped peanuts. So imagine this: salty (peanut, soy sauce), sweet (brown sugar), garlicky and gingery, crunchy and a hit of tang (rice vinegar). You can also include a spoonful of hot chili sauce if you’d like. If you’ve never used rice vinegar before, it’s one of my must-have pantry items for Asian foods. Look for “rice vinegar” on the label – it’s easy to confuse it with “rice wine,” but they are very different products. One is a tangy vinegar, and the other is cooking wine. There are two kinds of rice vinegar: regular and seasoned (or sweetened). You can use either in this recipe, but I prefer the regular, since we’re using brown sugar in the marinade. You’ll have to read the label carefully or just look for the color differences on the label. 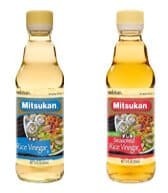 Mitsukan (a client of moi) uses BLUE for unsweetened or regular rice vinegar and RED for sweetened or seasoned. And as for the peanut butter – chunky or smooth, it’s up to you! I’m a chunky gal myself. And I don’t mean the size of my thighs. Start by slicing your chicken into long, thin strips. You can use either chicken breast or thighs (I prefer dark meat, but it’s totally up to you!). Try to get the chicken strips all similar in thickness (uh, actually thinness) so that they’ll cook evenly. See how thin I like to slice? If they’re not quite thin enough, smash ’em with your chef’s knife. Lay your chef’s knife flat on the chicken and use the heel of your hand to pound the strip flat. 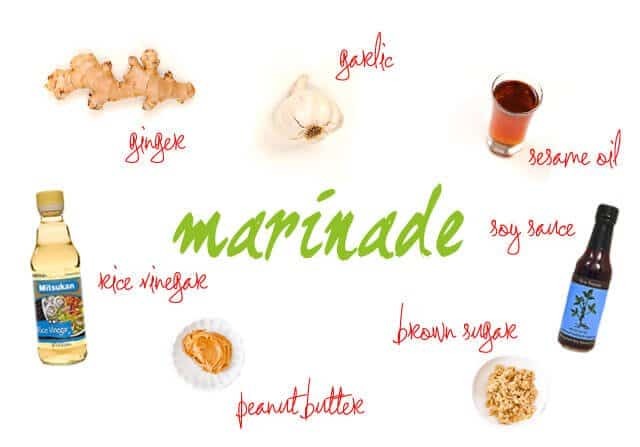 Mix your marinade and let the chicken marinate from 30 minutes to overnight in the refrigerator. 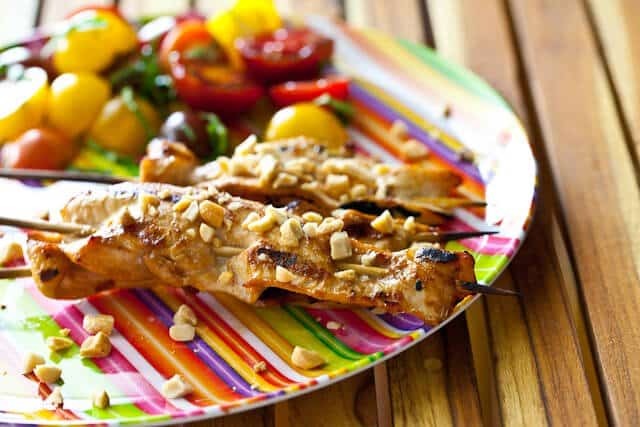 The chicken satay grills up really fast, so cook them right before you want to serve. About 4 minutes each side over hot flames! Top with chopped peanuts and serve! 1. 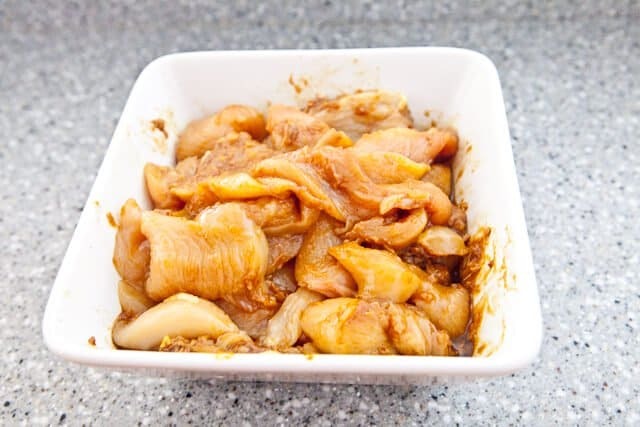 In a large bowl, combine the garlic, ginger, rice vinegar, soy sauce, brown sugar, peanut butter and sesame oil. Set the marinade aside. 2. 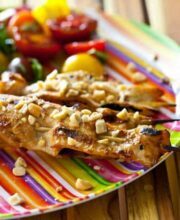 Slice the chicken breasts into long, thin strips. Add the chicken strips to the marinade and mix well. Refrigerate 1 hour or for up to overnight. 3. When ready to cook, preheat the grill - high heat on one side and low heat on the other side. 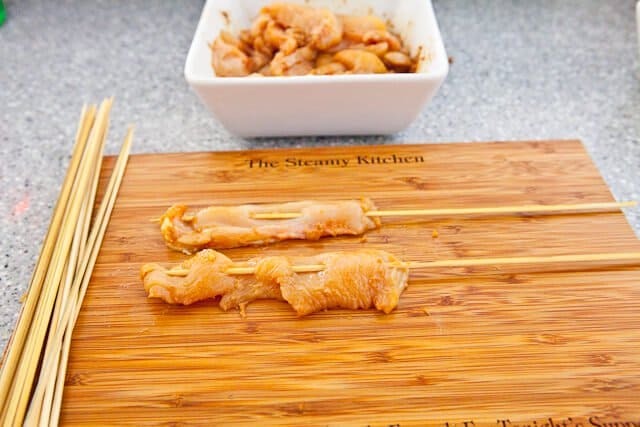 Thread the chicken strips onto the bamboo skewers, keeping the chicken as flat as you can so that they cook evenly. Grill the chicken skewers, starting on the high heat side for 4 minutes each side. 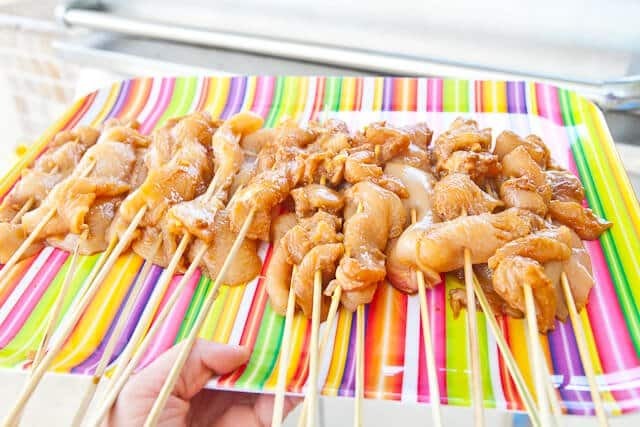 The move the skewers to the low heat side, cover and finish cooking, about 1-3 minutes more, depending on the thickness of your chicken. 4. Serve with chopped roasted peanuts sprinkled on top.